Life insurance pays an insured amount to your beneficiaries when you die. Life Insurance cover with AMIST Super is provided in units of cover. The amount of cover depends on age at the time of a claim and occupational status of the person insured. The default level of Life Insurance cover provided is two units. Please refer to our Insurance Guide for full details, costs and the amount of cover provided. 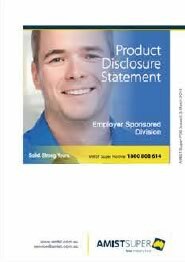 Employer Sponsored Division members click here. Personal Division members click here. TPD Insurance is a lump sum payment you receive if it’s determined that you have been totally and permanently disabled and are permanently unable to work in any occupation. TPD Insurance cover with AMIST Super is provided in units of cover. The default level of TPD insurance cover provided is one unit. Please note that TPD Insurance cover must be taken in conjunction with Life Insurance cover and cannot be held on its own. Please refer to our Insurance Guide for full details, costs and the amount of cover provided. New members in the Employer Sponsored Division have a one-off special opportunity to apply for double the amount of Life Insurance and TPD cover automatically. There is no need to complete any medical questionnaire or provide any medical information. If you don’t qualify for the special opportunity to double your cover or you want more cover you can apply at any time by completing the “Application to change Life and/or TPD” (PDF, 234KB) form. For more information, please read the relevant Insurance Guide, depending on whether you are a member of the Employer Sponsored Division (PDF, 1.6MB) or the Personal Division (PDF, 1.7MB). You can also call the AMIST Super Hotline on 1800 808 614 for assistance. You have up to 12 months from the date of the event to request the increase in cover. To apply, you will need to complete the Application to increase insurance – Life Events (PDF, 672KB) or call the AMIST Super Hotline on 1800 808 614 for a printed copy. Note: Increase in cover under the life event provisions is limited to an additional 3 units during your membership and one unit per life event per year. Members must confirm they are in Active Employment and supply sufficient evidence of the event to be eligible for an increase.